In today’s article, we’re going to share the best finance WordPress themes that we’ve found for 2017. 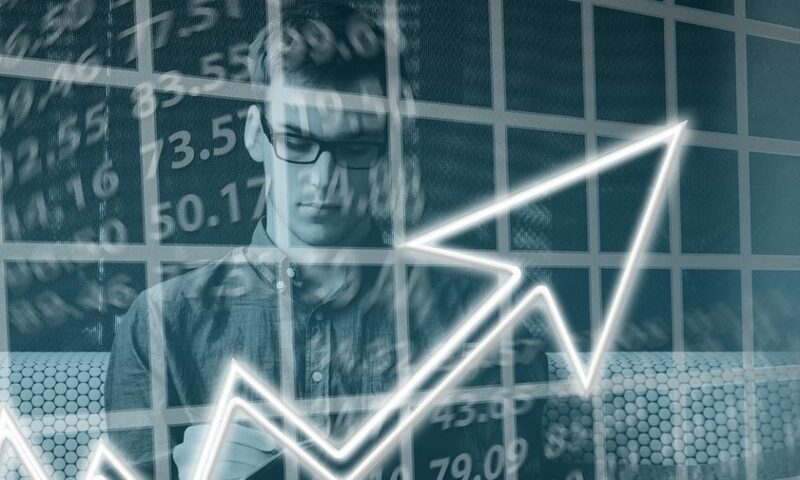 The themes listed here in this roundup are all up to date, standard, easy to use and created specifically for financial businesses such as accountancy, investment firms, financial consultants, advisors and other finance-related websites. Using these handpicked financial WordPress themes, you don’t need to know any technical or WordPress-Specific knowledge. All you need is the basic knowledge of working with WordPress. They include page builders by default which is a convenient way to manage your site’s content. Also, they come with demo importer tools which let you clone the demo sites easily. And finally, all of them are highly customizable, offering multiple options to control every aspect of your website design and features. You can change colors, fonts; enable/disable sections, and use your favorite header/footer layouts. Financity is an all-in-one solution for financial companies and other business related to finance in general. It’s a huge theme with exceptional features and stunning design. The theme comes with advanced features out of the box such as the GoodLayers Page builder, Demo Importer, fully responsive to all major devices, and advanced admin panel. Your theme also can be updated right from your WordPress dashboard with a single click. With Financity WordPress theme, you get lots of templates and layout variations to choose from for different sections such as 14 blog layouts, 9 Portfolio layouts, and 6 gallery variations. Also, various pre-made pages, career, team, contact, pricing table, coming soon, service, case studies and other pages will simplify the launch of your site. All you need is to use the one-click importer and that’s it. Everything is ready and you can modify the content with the drag-n-drop page builder to personalize it. 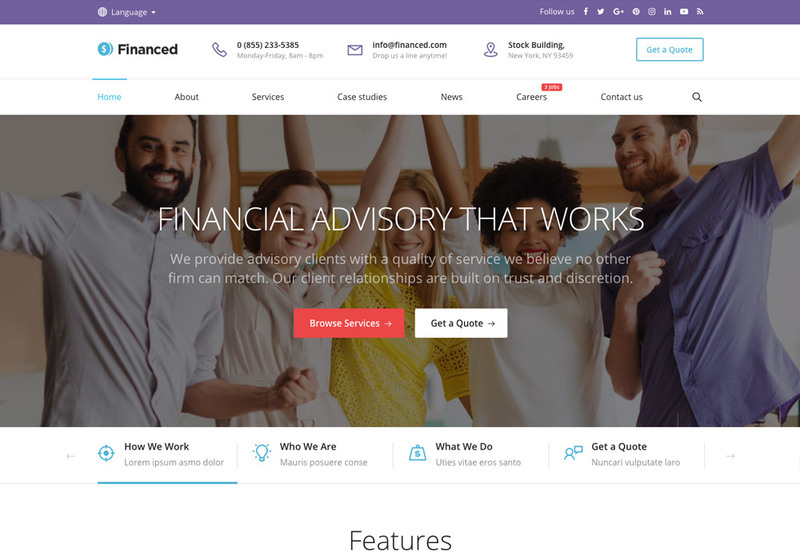 Overall, from the finance WordPress themes listed in this roundup, Financity is the best one if you ask us. 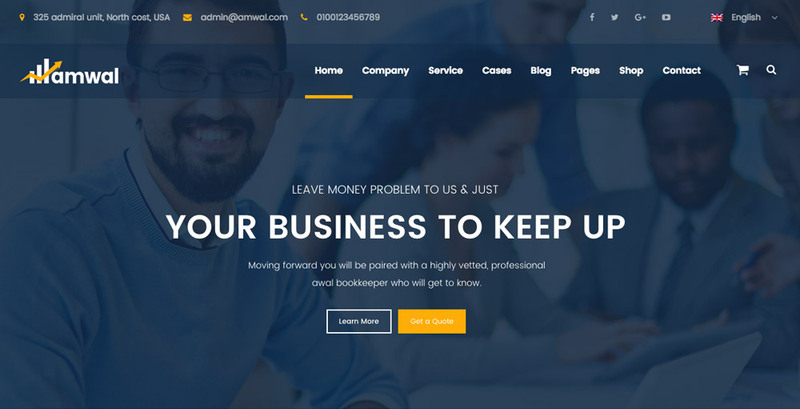 Amwal is consulting, business, and finance WordPress theme. If you run financial business and need to start your website easily yet in a professional way, Amwal is a great choice as it has many features to offer to such businesses. The theme includes 10 pre-made homepage templates which can be imported easily, giving you several options to make your site unique. Also, not just offering multiple homepages, it comes with 8 variant header layouts, 6 footer layouts, multiple services UI elements, and the popular WordPress plugins, Slider Revolution and Visual Composer. Go and personalize it even more, by the unlimited color schemes and WP customizer with lots of options. However, you don’t need to tweak things from scratch, you can skip them and have your site up and running by importing demo content with the 1 click installation feature. Lastly, if you come from an RTL language, no issue, it’s supported – even multi-lingual websites are supported as well. Amwal has got 9 ratings with 5 stars from the buyers among other finance WordPress themes. Check it out now! 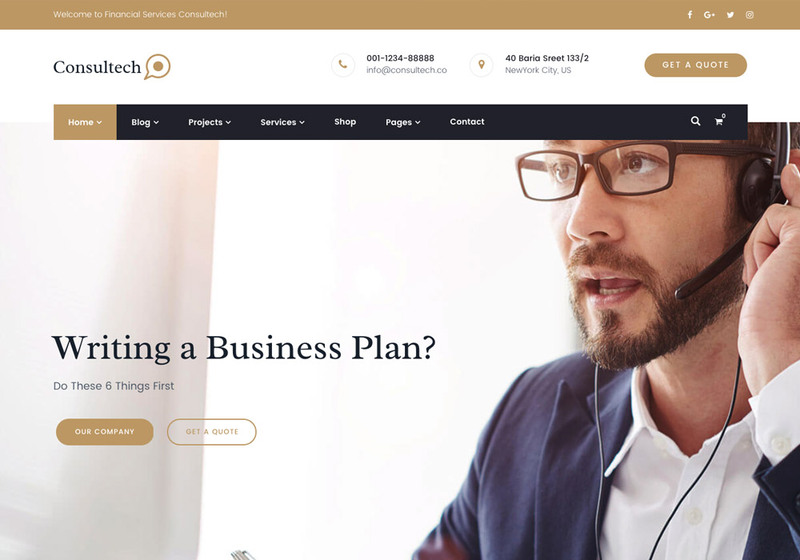 For finance companies, financial firms, consulting agencies, broker, investment and other finance-related websites, you have many many multipurpose WordPress themes as an option to use, but using more specific niche themes like Financed has more advantages. Financed has been created to cover those specific requirements of finance websites by offering various sections and options. 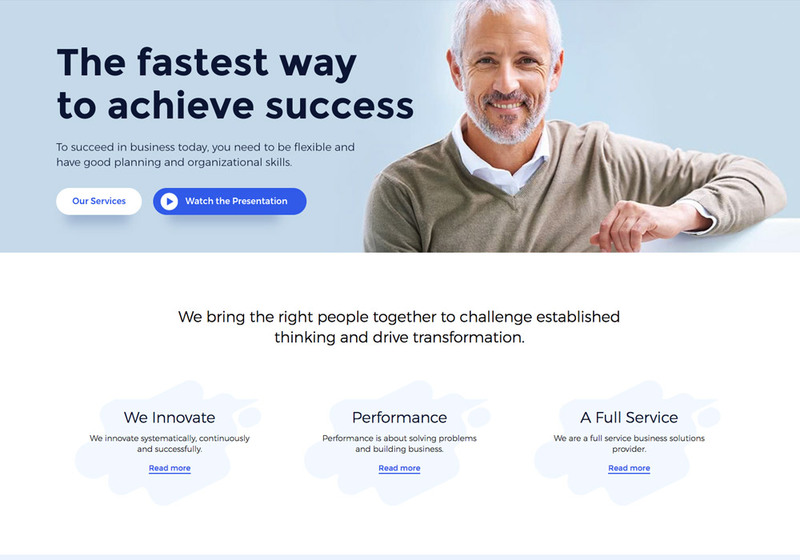 Four demo homepage layouts, parallax homepage, a cool whiteboard homepage, case study, careers, services, and other ready to use pages will help you advertise your financial services easier and better. Besides being feature-rich, it also has a visually appealing design which consistently works on all devices. The great usage of icons, white space, typography, and colors is a noteworthy feature of the design. Also, personally I like the pricing table design. It’s simple and elegant. The theme has many happy users according to the number of 5-star ratings – go and check it out yourself. 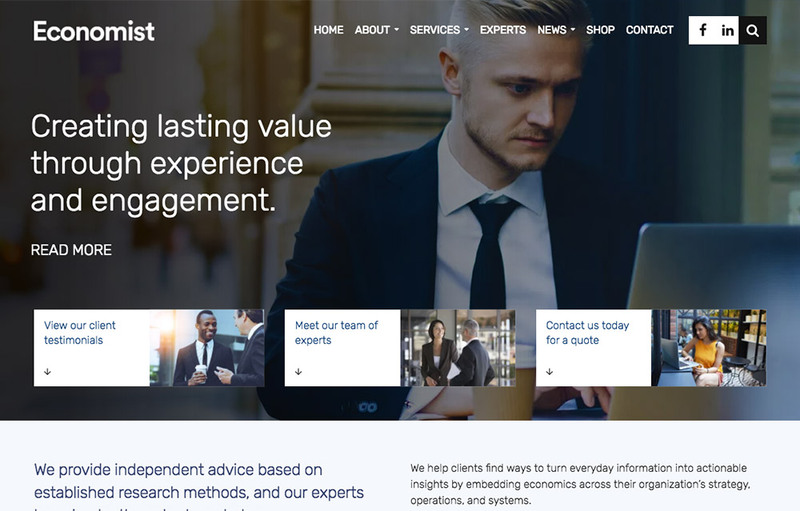 From a Power Elite Author at Envato, meet Consultancy, a Consulting Finance WordPress theme. It’s relatively a new release with some distinctive features. This niche WordPress theme is built for any business operating in the area of consulting or finance industry. Advisors, insurance brokers, accountants, lawyers, consultants, or other related businesses. With Consultancy, you have many premium finance-related images which cost around $450. All images you see on the demo site are available for you to use on your website without the need to buy any additional licenses. The theme comes with more unique features such as custom created icons, multiple creative homepage templates, 23 HD video tutorials for beginners, and of course $197 worth premium products. Furthermore, if you’re a beginner WordPress user, by purchasing this theme you’ll have access to WP 101 video tutorials for free which normally cost $87. Of course, if you’re a book lover, you can always find the best WordPress books here. 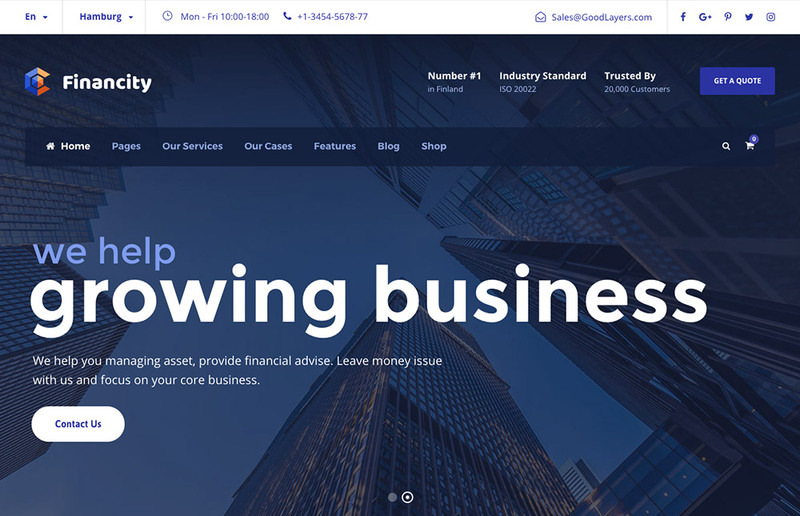 If you’re looking for a trusted finance WordPress theme from a reputable company, consultancy is a serious choice. Consulttech is another WordPress theme exclusively designed for finance-related businesses. It has a classical design which you see on this type of websites a lot. The theme includes 6 homepages with various UI elements targeted to finance and consulting businesses. And, 5 header variations with different location of the menu make it easier to create a unique feeling for your brand. In terms of features, you can clone the demo easily with the 1-click installer, change the colors, have an online shop with WooCommerce, use the included Visual Composer page builder, and benefit from many shortcodes that come with this theme. 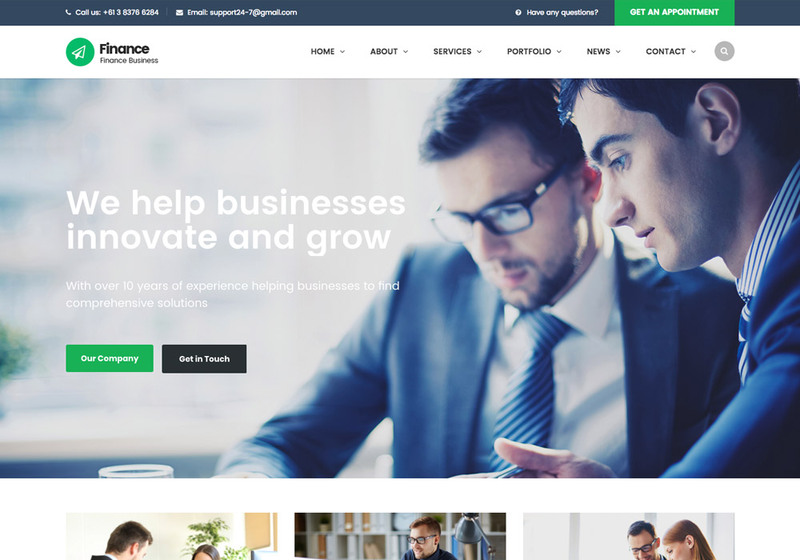 Finance Theme, as the name suggests, is a finance WordPress theme which is best suited for accounting, consulting, coaching, law office, and other business related websites. The theme is responsive and optimized for small devices bringing great user experience for all visitors no matter what their device size is. With finance, you have the freedom to choose from 5 header layouts for you header/navigation part of your website and again five homepage layouts, which can be extended even more because you have the magical page builder tool at your disposal meaning that you can create unlimited homepages or inner pages just by drag-n-dropping ready elements. F&O is a consultant Finance WordPress theme which made it easy to start a finance website by offering nine ready to import homepage templates and many other ready to use UI elements. With F&O you can benefit from the 1-click theme installer and get everything up-and-running in a few minutes. As the theme is based on Visual Composer, creating/editing the pages won’t be an issue since the plugin is well-known for its ease of use. However, F&O has included 60+ VC block elements which help you be creative and build attractive landing pages. You can also choose from over 700 google fonts easily and tweak the typography to personalize it as you like. Don’t worry about the customer support, because according to the item ratings, the buyers are happy with that. 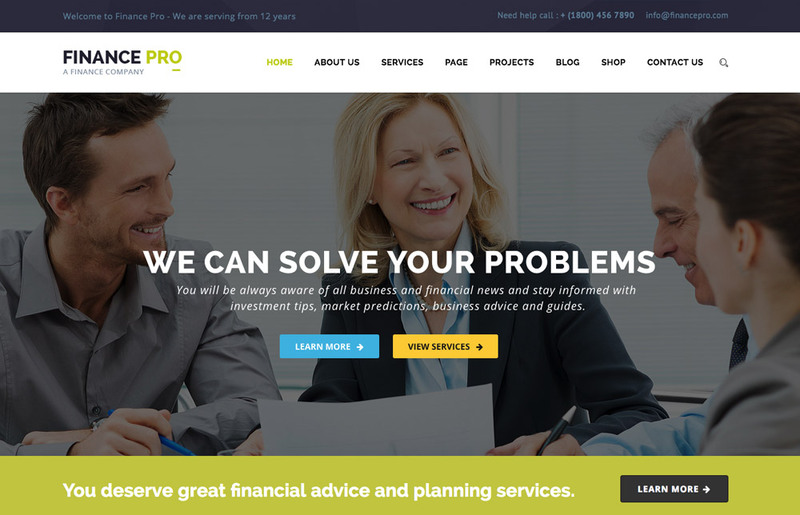 Meet Finance Pro, and exclusively built WordPress theme for financial companies. The theme comes with the necessary features for your online presence as a finance business. Checking the current five demo sites would convince you that you’re considering a worthy finance WordPress theme. It seems that the author has covered all features or pages you might need for your business. For example, you’ll see many ready pages for different types of services such as business load, insurance consulting, financial planning, retirement planning, taxes planning, business growth, investment management and more. Finance Pro is also compatible with WooCommerce, Contact Form 7, WPML and includes Visual Composer plugin. You can also get the PSDs for free by contacting the support team. 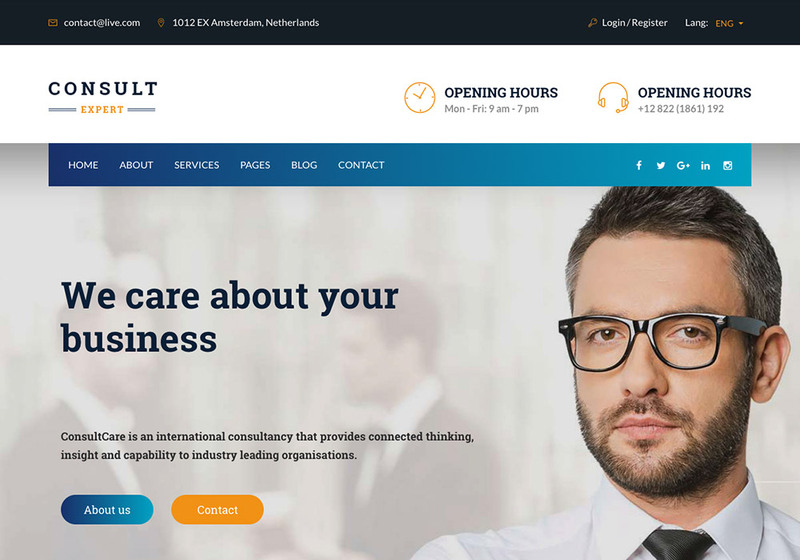 Looking for a great WordPress theme for your accounting, consulting, or finance business? Finance Hawk is yours. 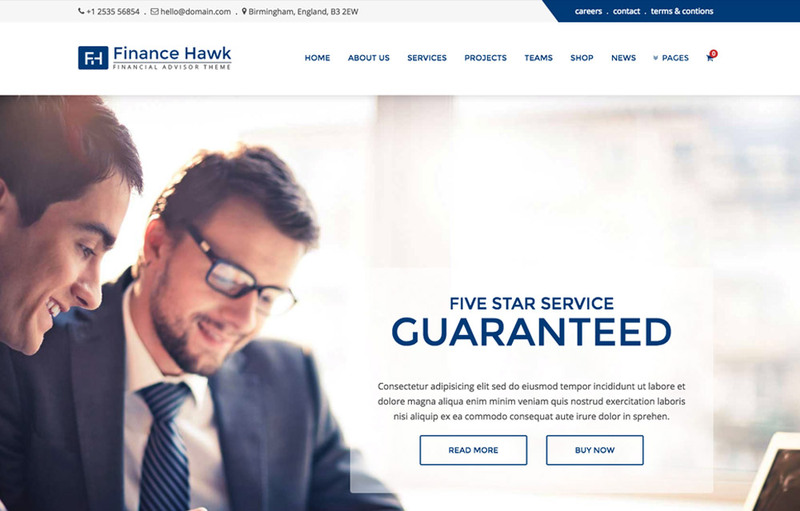 Finance Hawk offers six home pages, two service pages, event management section, mega menu and a lot more features. Economist is a theme for financial companies or any other small business. The theme is based on Visual Composer page builder and comes with great flexibility in term of layout options. You have boxed and wide layout, optional sticky header, sidebar alignment option and ability to use background photos or pattern. It also gives you a great control over the header design. You can change the logo and header height, adjust the colors, change typography and use the premium plugin Layer Slider which is worth $18. Economist is beginner friendly. It includes a narrated video tutorial plus an easy to use demo installer which allows you to setup your site in a few minutes without any technical knowledge. Consult Expert is multipurpose finance WordPress theme which can be used for a wide range of similar businesses. The theme has been designed very well with a great typography and nice colors. The theme includes multiple homepage styles, blog layouts, services pages and various relevant pages which make your life easier to build your site. It also comes with Slider Revolution, Visual Composer – the two most used plugins in 2017, letting you create stunning effects and unlimited page layouts via a convenient user interface. With the power of customization features, you can easily change every aspect of the theme. Change colors, typography and layout options.